Draining of these wetlands, livestock grazing, and dams have significantly reduced its habitat. For instance, 95% of the wetlands in the Willamette Valley and Klamath Basin have been lost. Needless to say, loss of wetlands affects many other wildlife species besides frogs, so the endangerment of the spotted frog is a canary in the coal mine signaling that we must reverse this trend. 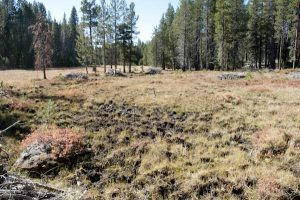 One of the strongholds for the Oregon Spotted Frog is located on the 170,000-acre Antelope Grazing Allotment on the Fremont-Winema National Forest at the headwaters of Jack Creek. The Jack Creek area contains the largest concentration of fens (wetlands) in the Pacific Northwest which support many endangered plants and mollusks (two found no place else in the entire world), as well as an isolated Oregon spotted frog population. Despite the vast acreage of the Antelope Allotment, nearly all the water on the allotment is concentrated in the Jack Creek drainage—hence that is where the majority of cattle are concentrated. Therefore, livestock tramping of riparian areas, soil compaction, water pollution, and the spread of exotic plants grazing is damaging the fens and creek which is the frog’s habitat. The Forest Service reaction to this well-documented damage was to spend taxpayer funds to build more fences, water troughs, and other developments to try to mitigate livestock impacts from a private business using public resources for personal profit. 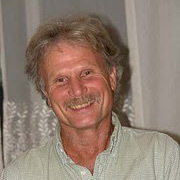 A number of environmental groups including Western Watersheds Project, Oregon Wild, Great Old Broads for Wilderness, Concerned Friends of the Winema, KS Wild have all questioned the Forest Service practices. Indeed, twice the courts have found the Forest Service in violation of the National Forest Management Act (“NFMA”) and the National Environmental Policy Act (“NEPA”), while the FWS biological opinion that reviewed grazing impacts was ruled arbitrary and capricious. 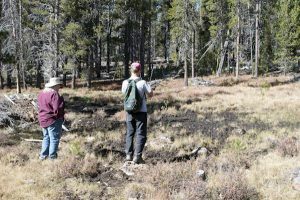 The Forest Service is now proposing to reissue the grazing privileges for another ten years and to expand grazing into previously closed areas including six more miles of Jack Creek which is prime spotted frog habitat. The Forest Service hopes its new grazing plan will disperse livestock impacts over a larger area. This strategy is analogous to building a taller smoke stack so a polluting factory can spread poisons over a larger airshed. From a public interest perspective, closing the allotment is the most economical and ecological beneficial management strategy. Yet the Forest Service continues to work overtime on behalf of the rancher and his livestock over the public’s interest in protecting water quality and endangered species. Why is the Forest Service fighting so hard to maintain one rancher’s grazing privileges on our public lands? Why does it imperil rare species to accommodate cattle which are abundant and have many places to graze other than on some of the rarest fens and wildlife habitat in the Pacific Northwest? I can’t presume to read the mind of these public employees, but someone needs to remind them that they are working for all Americans, not just the private business interests of a few well-connected ranchers. The Oregon spotted frog deserves a better future than what the Forest Service is serving up.